"He is not a man in general, he is a man in particular." Fulfilling both words that combine in the term "cinéma vérité," François Truffaut chronicled his own coming of age through a character of his own devising, Antoine Doinel, compositing fact with fiction over the course of 5 films and spanning two decades. As well as presenting Truffaut's own memories through this on-screen persona, Jean-Pierre Léaud brings his own process and experience to Doinel, as the young actor parallels his alter ego into adulthood before us on film. The cumulative result presents a biographical archive of the three men, a combination of three lives, with a perspective that is unique in cinematic history. Finally, Criterion has assembled the collected works of François Truffaut's Doinel saga in one monumental set. Bravo! In his debut appearance, the young Antoine (Léaud) lives with his uninterested mother (Maurier) and her husband Julian Doinel (Rémy), the man who gave her son his name. Mme. Doinel is youthful, attractive, and terribly unhappy. The only time we see his mother attentive is when she attempts to distract Antoine from an indiscretion he witnesses; we understand this troubled child from the first frame. Antoine, like so many of his generation, is expected to be seen and not heard when his working class parents finally arrive home. Mostly ignored, he seems to have a rich, if misguided imagination that leads him into the sort of trouble that, these days, is referred to as "negative attention"; the film's title, The 400 Blows, is an expression better translated as "raising hell." The boy does exactly that, for his parents, his teachers, but, ultimately himself. Easily persuaded into delinquency by his friend René, Antoine compounds his already troubled childhood in a series of actions—cutting school, lying, running away, common thievery—creating a domino effect that leads his stepfather to turn him over to the police and lands the boy in a detention center. Like all adolescents, Antoine longs for control of his own life while craving the approval of his inapproachable parents. There is a dichotomy of responsibility alive in these scenes: while Antoine's parents all but ignore him, he is left to invent his own way and yet, when he does not meet their expectations, he is berated for the results of their abandonment. While the film's end frame is legendary—the young boy backed against the ocean, his expression both pleading and accusatory as he looks to us, the audience, his jury—there is powerful symbolism in an earlier scene that describes the true struggle of adolescence. Playing hooky, the boys make their way to an arcade and René watches from above as Antoine takes a spin in the Gravitron. In this 90-second take, the young boy experiences the innocent fun of being pinned to the spinning wall by gravity, but as he crawls about under the pressure, his contortions belie his struggle against the forces that, beyond his volition, oppress him. Léaud is a natural; obviously Truffaut saw this immediately. The success of the film rests in his young expression, and at times it flays the heart. When a psychologist interviews Antoine, it is Léaud's eyes that face the camera and his inherent mischievousness, his genuine and convincing nature that deal the emotional blow. One of three films that defined the avant garde of a cinematic revolution in 1959 (the others: Jean-Luc Godard's Breathless and Alain Resnais' Hiroshima, Mon Amour), The 400 Blows is a young man's stand against the bourgeois ethos of his era—Truffaut's and Doinel's—and both struggles are equally poignant and bold. It has since been recognized as landmark cinema, and is truly the cornerstone in Truffaut's brilliant career, cut short at the age of 52. Antoine: See you in a bit, then. Colette: You will if I'm there. Antoine & Colette, the second installment in the story, was created as part of an international anthology called Love at Twenty. The presentation here includes the full main titles of the feature plus Truffaut's contribution. Despite the collective title, Antoine is now 18 and working as a clerk at a Philips LP record manufactory. He has indeed survived his unpleasant childhood and is finally out on his own, making his way in the world. At a Youth Series concert, he sees a young woman, Colette (Marie-France Pisier) and immediately falls in love with her. Still awkward but bold, he eventually manages to meet her, but he has much to learn about intimacy. In an act of obsession, he takes a room directly across the street from where belle passion lives with her parents. Despite befriending her and charming her parents, Antoine is still out in the cold, in despair and humiliation as Colette rejects his romantic advances, treating him more like a kid cousin. Léaud, with much of the innocent mischief gone from his maturing features, turns in a fine performance here, alternately hopeful and despairing, clumsily groping at affection not provided by his parents. Pisier, with the same haughty attractiveness of Mme. Doinel, inspires affection but spares none for Antoine. The importance of music in Antoine's life is further developed here; not only does he work making LPs, but when alone he plays them constantly, and he offers the first pressing he makes to Colette, who receives it with disdain. Bittersweet in its recollection of first love and the pain as it goes unrequited, Antoine & Colette easily conveys its meaningful statement. Melancholy and hilarious, Stolen Kisses, finds the engaging enfant terrible now in his twenties, and as the film opens, Antoine is dismissed from his military service, during which, we are not surprised to discover, he was mostly AWOL. Back in civilian life, the parents of his sweetheart welcome Antoine with more affection than Christine (Jade) herself. M. Darbon (Ceccaldi) sets him up with a job as night clerk at a hotel, which he botches miserably but leads him to his next position as a fledgling detective at a private agency. While he and Christine feel their way back to each other, Antoine passes through experiences that are meant to mature him; some succeed, some don't. While it's not necessary to have followed Antoine's life to this point to enjoy this romantic comedy, Truffaut invites those who have to join his society of insiders with carefully placed references throughout the story (the adolescent Doinel kept a shrine to Balzac; in the opening scene here, he is reading Balzac's Le Lys dans la vallée). Those who expect the rebel child of The 400 Blows to grow up mutinous and defiant may be disappointed; people do change, and Truffaut remains more faithful to life than to his audience in this regard. Antoine is now more hapless than resourceful, more selfish than self-destructive. In this phase of the Doinel series, Antoine is not so much set adrift as drifting; now responsible for his own destiny, the young man returns again and again to the safe harbor that the family Darbon offers. The director takes a lighthearted approach; this is one of Truffaut's brightest comedies, and he himself has great fun behind the camera. He frames a brilliant scene at the detective agency in which three different conversations continue simultaneously while focusing on the least important of them. At another point, a dentist is brought down from his office upstairs to deal with an unruly client at the agency—why the dentist?—for no apparent reason. Catherine: I followed her to 18 Place d'Anvers, where she stayed for an hour and a half. M. Blady: To whose apartment did she go? Antoine: I know where she was. Antoine is temporarily sidetracked in the fashion of Benjamin Braddock (released a year earlier) by Fabienne (Seyrig), the wife of his client, M. Tobard (Lonsdale). In a continuing homage, the young man likens their attraction to the affair central to Balzac's Le Lys dans la vallée, but Mme. Tobard strips the romance away by declaring, "I'm not an apparition. I'm a woman, which is the opposite." However, as in The Graduate, their encounter leads Antoine back to his girl, and to the sweetest use of a bottle opener ever printed to film. Truffaut is synonymous with spontaneity, and it is everywhere in this charming billet doux. His camera creates action and excitement and manages to compress his compositions into impossible abstracts. Léaud is at once intense and distracted, looking more and more like Truffaut as he matures. He is particularly riveting in a scene in front of his bathroom mirror when he manically repeats first the name of his soon-to-be seductress ("Fabienne Tobard, Fabienne Tobard, Fabienne Tobard..."), then his girlfriend's ("Christine Darbon, Christine Darbon, Christine Darbon....") and finally his own ("Antoine Doinel, Antoine Doinel, Antoine Doinel...") until it seems his lungs will burst. Claude Jade makes her film debut as the serious young violinist who should run as far from the turbulent Doinel as she can, but instead becomes his anchor. The Darbons, who we will see more of in the fourth film, Bed & Board, are ideal parents, seeming especially so to the tattered Antoine, and the rest of the ensemble play their low-key, madcap roles admirably. Of course, the streets and rooftops of Paris were to Truffaut what New York would become to Woody Allen. Antoine's world is Montmartre, and Le Sacré-Coeur presides over his life, there to bless or curse him. No one captures the City of Lights as effortlessly as this director. In an absurd and hilarious nod to cinematic devices, make sure to keep your eyes on a character billed only as "l'inconnu"—the "unknown." In this fourth installment, our young man is married and about to become a father himself (he calls his son Alphonse, the name of Léaud's character in his non-Doinel Truffaut outing, Day for Night). His wife, Christine (Jade), is now a violin teacher and the couple blissfully struggle with obstacles common to all young marriages. Our neglected and misunderstood delinquent of The 400 Blows seems now to have the attention he so desperately desired in his youth: a devoted wife, the parental support of his in-laws, and the affection of all who know him. What can be wanting? It would appear to be the maturity to recognize these gifts and the responsible nature to accept them. Domicile conjugal (Bed & Board—another sorry translation) is again a fairly lighthearted comedy that belies the arrogant and restless nature that still possesses Doinel. With everything in place, he mucks it up by falling in with Kyoko (Berghauer), a Japanese woman he meets at his new job for an American corporation based in Paris—a position he stumbles into as with everything else. Early in the story, Antoine works for a florist right in the courtyard of their apartment building and there are some comical vignettes with the various inhabitants, including a cameo by Jacques Tati. Although humor flows throughout the film, after Christine discovers Antoine's affair the laughs becomes more subdued. As in Stolen Kisses, Claude Jade balances a playful seriousness that anchors her less polished partner. Léaud is still lovable as our protagonist, in that incorrigible way men who never grow up seem to use to best advantage. In the end it is Truffaut's film. While stylistically rough, he has lost the edginess that rocked the world just a decade before and sinks his hands deep into the fertile soil of nostalgia. Not necessarily a bad thing, and surely not as criminal as his detractors would have us believe. Doinel's story is Truffaut's story; the filmmaker is himself maturing, and perhaps more than his alter ego, has gained a sense of responsibility. He's simply moved on. With the completion of the previous film, Bed & Board, Truffaut believed his histoire Doinel had come to an end. Antoine had reached adulthood, and Jean-Pierre Léaud, of course, had too. The chronicling of realistic adolescence, so dear to the director's heart, could no longer be portrayed by his beloved character nor his human embodiment, so in Truffaut's mind, it was finished. Exactly why, then, he chose to write this final chapter, is still a mystery—while the decision to end with Bed & Board is discussed several times in the accompanying material, there is no mention why then Truffaut created one last chapter. In final film of this autobiographical saga, Antoine Doinel is now in his thirties and faces his past in a series of encounters with now familiar faces. The director makes good use of flashback material from the four previous films, both to remind series followers and to provide background exposition, neatly accommodating his character's resolution (though the overuse of this device in budget-challenged sitcom episodes will make it seem less impressive to modern audiences). Antoine and Christine, his now estranged wife—whom he wooed in Stolen Kisses and married in Bed & Board—meet to sign their divorce papers. This is not just any divorce, it is France's first no-fault dissolution, and the press surrounds the ex-couple on the courthouse steps. At the edge of the crowd is Colette (reprised by Pisier), who recognizes the young man who all but stalked her years ago. Far from the carefree girl he knew, she is now a lawyer and in love with Xavier (Mesguich), an arrogant bookseller. Their paths will cross again, but not quite yet. "Always running. Hasn't changed a bit!" Colette remarks, watching as her old friend flees the scene. At the station, Antoine sees Colette on a train heading south and in a moment of ill-conceived passion, he jumps on board. Colette has Antoine's novel in hand, and over the miles she flips through the pages (a clever and convenient device for the director) and recalls their younger days. The train covers some distance before they meet, and he rides with her long enough to discuss the past and their lives now, for better or worse. Before the story ends, M. Lucien (Bertheau), Mme. Doinel's last lover, will call on Antoine and help to explain a mother's conflicted motivations toward her son; Christine and Colette will meet, both on their way to persuade Sabine to reconcile with Antoine, for whom they each still have great affection. Will Antoine win Sabine back? Has he come to understand the nature of responsibility—can he stop running? As we have followed the peccadilloes of Antoine Doinel, we have followed the career of François Truffaut. The anarchic wild child is now a man who will be credited with having redefined his craft, and if some of that youthful thrill is gone, it has been replaced by other, more substantive elements. With Jules et Jim and Day for Night behind him, and 1980's The Last Metro next on his slate, Truffaut is a self-made man. His confidence as a filmmaker is fully formed, and his early recklessness is now reined by a masterful hand. In L'Amour en fuite, Truffaut takes a fond look back at his journey in the guise of his alter ego. While Doinel continues to struggle with commitment, Truffaut bids him farewell, his future unresolved but assured. "Whenever I work with François, it's like a vacation, or a dream, or a state of grace." Jean-Pierre Léaud is ever an extension of Truffaut, but never in the way of puppetmaster; Léaud continues his organic approach to Antoine that is uniquely his own. Claude Jade has matured along with Christine, a woman of substance and infinite patience. The two are as charming together as ever, and more comfortable than most married couples, even if their characters' union is heading for dissolution. Dorothée is adorable and disarmingly believable as the headstrong Sabine, and it is a delight to see the ever-handsome Marie-France Pisier return as a Colette who, too, has a few life-altering experiences behind her. Followers of the director and his Doinel character should find satisfaction in Truffaut's 20-year, five-film project. Each entry carries its weight individually; collectively, they make an ambitious and entertaining character study that succeeds with impact, charm and confidence. Image Transfer Review: Those wondering whether it is worth upgrading their first pressing version of The 400 Blows should wonder no longer. That disc, one of the first DVDs issued by Criterion, is, by comparison to this new transfer, a complete mess. Truffaut's visual design contains a multitude of diagonal lines and straightedges, all of which are difficult to compress under the best of circumstances. The old disc's nonanamorphic transfer suffers from terrible aliasing, jagged edges, moiré effects and the like. These are immediately seen in the long panning shot through the streets of Paris that underlie the main titles. While there is still a bit of aliasing present on the new anamorphic transfer, the differences are like night and day. No longer is the video a test of the viewer's ability to overlook compression artifacts. The result is a detailed and enjoyable video experience that nicely captures the detail in the print (which appears to be the same source print; I didn't notice any additional cleanup of the rather frequent speckling). The same excellent greyscale is demonstrated here as on the original disc. A close examination, however, reveals that the framing is slightly different between the two discs. The new Criterion disc is slightly cropped on both sides in comparison to the earlier one, even after accounting for overscan. This defect is, however, greatly outweighed by the superior transfer, but nonetheless has to be counted as a demerit. Antoine & Colette, by contrast, is not markedly superior to the nonanamorphic Fox Lorber disc from a video standpoint. There is some minor improvement of detail, but overall that quite satisfactory transfer isn't outshone by the new anamorphic one. The color films, presented in 1.85:1 anamorphic widescreen, all have a rather dated Eastmancolor look to them, but are in generally fine condition. (When comparing to the earlier Fox Lorber releases, one has to be grateful for the tradeoff: those transfers, while more saturated and vibrant, now appear muddy and at times terribly soft, with much of the detail blown out in the harshest areas.) There is a dark stain visible briefly in Stolen Kisses, but it's the only serious flaw besides occasional speckling. Shadow detail and fine detail are acceptable, given the heavy grain that is present as a natural result of the cinema vérité style. Alas, during Bed & Board in the climactic 'Mikado' shot, the color demonstrates serious instability and flicker that diminishes the intended impact of the shot. Audio Transfer Review: The improvement on The 400 Blows is also present in the audio dimension, though not to the striking extent that one finds in the video aspect. The old DVD had a low electronic sounding hum present in a number of scenes; that is now thankfully banished. While there is still a fair amount of noise and hiss from the original source material, it's now at a much more tolerable level and doesn't interfere with the dialogue as much as it did on the prior disc. The sound is a rudimentary 1.0 mono that befits the subject matter and the visual style. Whereas Antoine & Colette was not a marked improvement over the earlier disc from a visual standpoint, Criterion has done an excellent job of cleaning up the obnoxiously poor audio of that DVD. The hiss and noise are banished, with the result a fine and clean soundtrack. The music at the concerts still tends to be rather shrill, but that seems to be a limitation of the original audio. The same applies to the three later features, which are clean but often harsh, particularly when music is being played. Still, for their age these are quite acceptable 1.0 soundtracks and enormous improvements over their usual conditions. A 72-page book containing essays, work notes, etc. If a person is always on the run, we say he's living out of his suitcase. Befitting our hero, the collection of his life adventures comes in one. The box containing the five slipcases and accompanying booklet resembles the baggage of A.D.'s life; inside, each slipcase is printed to resemble his signature costume from the respective film, cleaned, pressed and banded by the launderer, packed to go. Charmingly creative and unique. And don't miss peeking inside the emptied box—the metaphor has been detailed in every way. This package is the stuff awards are invented for. The 400 Blows is by far the most heavily extras-stocked disc in the set, befitting its importance as a watershed film. The 1992 commentary by Professor Brian Stonehill from the original DVD (and the laserdisc) is ported over in its entirety and provides an entertaining and not-too-dry comment on the technical and historical aspects of the film. A new, second commentary features Robert Lachenay, Truffaut's boyhood friend (and assistant director), personified in the film as Antoine's school chum, René Bigey. This replaces the quite unsatisfactory commentary from the old discs that also featured a poor recording of Lachenay and screenwriter Moussy; that commentary was made even more dispensable for those of us who don't speak French by the omission of any English subtitles. Happily, that rather ridiculous omission is remedied in this new set, and English-only speakers may now find out what M. Lachenay has to say. He has an intriguing combination of knowledge of the underlying facts as well as the actual making of the film that makes his commentary highly valuable for fans and students of the New Wave. But that's not all by a long shot. We also see 16 minutes of audition footage, including Léaud's audition and that of several other boys who wound up in various roles in the picture. Newsreel footage (5m:40s) of the Cannes festival of 1959 provides an interesting little interview with Léaud, who also appears in a 1965 television program centering on Truffaut (22m:23s). Finally, there is a segment from a 1960 episode of Cinepanorama with still more footage of Truffaut discussing the reception of the picture, his thoughts on Bardot and his difficulties with the Spanish censors. As is the case for all of the features, a theatrical trailer is provided in anamorphic widescreen. Oddly, there are no extras (except the text materials in the accompanying book) specific to Antoine & Colette; one would have expected at least the trailer for Love at Twenty amongst the wealth of materials. Stolen Kisses fares somewhat better here, though much of the extra material focuses on the controversy surrounding the abrupt dismissal of Henri Langlois, founder and director of the Cinémathèque française in 1968, just after filming began. As the materials document, Truffaut paid less attention to the actual making of the picture, preferring instead to organize a protest on the Langlois affair. The extras skate over the more dubious aspects of Langlois' tenure (such as permitting numerous films that he personally didn't like to decompose and become irretrievably lost), sharing instead Truffaut's rather myopic viewpoint. These collected newsreels are interesting for historical perspective, but don't really add much to the film proper. The most intriguing is the newsreel shot at the Cannes film festival for 1968, brought to a standstill and eventually shut down completely by Truffaut, Godard, Forman, Polanski and others, protesting police oppression (not to mention L'Affaire Langlois). The extras provided for Bed & Board tend to be a bit repetitive, as Truffaut insists that it is the end of the Doinel cycle in nearly every one of them. Four clips are included, each under five minutes in duration. Perhaps the most valuable is a behind-the-scene clip of the shooting of the film, where we get a tiny glimpse of the director's technique with actors. Clips of TV interviews with Truffaut and Léaud provide a little background but not much substance, and the mostly introductory Who is Antoine Doinel? from 1972 runs a bit over a minute and can do nothing more than provide a tiny recap of the first four films they have been previously viewed. Two Truffaut interviews from 1979 and 1980 are the extra content for Love on the Run; Marie-France Pisier also joins the former interview and has some interesting comments. Again, the focus is on the (this time genuine) end of the cycle. Intriguingly, Truffaut expresses serious dissatisfaction with the film to the point that it seems that he wishes he hadn't made it. While the experiment was more or less successful to give Doinel an overview, there is a lack of evolution in the character in the final offering that causes the director to feel the film is a failure. One seldom sees a director give such a negative appraisal of his own work, particularly something done just the year before, which makes the 1980 interview quite a surprise. But that's still not all. Criterion includes an entire bonus disc of extras, with packaging just as clever as the suitcase motif. Here the Thinpak case is mocked up as the cover of Doinel's novel, Les Salades de l'amour (an phrase that defies translation, but may best be said to mean "disastrous loves"—think "tossed salad") , just as it appears in Love on the Run, as if the book were thrown into the suitcase along with his clothes. Inside, the disc itself resembles a vinyl record, echoing Antoine's experiences in the Philips record factory in Love at Twenty, not to mention his general affection for music throughout the series. (He meets his first love at a concert, marries a violinist and winds up in the end with a record store clerk.) Very tidy. Truffaut's first credited film, Les Mistons (The Mischief Makers), from 1957 is the first and most important extra here. The short follows a group of young boys as they harass a pair of young lovers (Gérard Blain and Bernadette Lafont) throughout the running time, in a desperate attempt to come to terms with their own awakening sexuality. While the film is a shade pretentious and in love with the camera (including several undercranked sequences and one that runs backwards, reminiscent of Cocteau), this first essay by Truffaut examining the difficulties of adolescence is certainly worth viewing. It's a lovely and poetic short that proves to be the foundation for the Doinel series, as well as later films such as Small Change. Film historian Serge Toubiana provides another introduction to this film, and there is a full-length commentary by assistant director Claude de Givray. The commentary is interesting if spotty, but provides a look at the formative years of Truffaut. Most of the rest of the running time of the disc is made up of interviews over the years. Portrait of François Truffaut (24m:42s) is a an excerpt from a 1961 documentary by Serge Leroy, covering his early years with an emphasis on his desire to demystify cinema. He also relates some different anecdotes about the difficulties of working with the children in Les Mistons. Truffaut sits fidgeting in a chair—much like the young Léaud—only rarely confronting the camera with his eyes as he speaks about early influences Jean Renoir and Roberto Rosselini, and his admiration of their simplicity. How meticulous the restorations have been become apparent when viewing the clips included here. However, the downside is that these lengthy clips from Les Mistons and The 400 Blows will be repetitive to those who have marched headlong through the set. Working with François Truffaut is a substantial 1986 set of interviews (just two years after the director's untimely death) with de Givray and writer Bernard Revon. Among the expected topics of the scripting and filming of the Doinel series, they cover the influence that Lubitsch had upon Truffaut, reveal their friend's work habits, touch upon some fascinating unfinished projects that Truffaut's death cut short and also shed a more intimate light on his personality. There's some dodgy bluescreen work, and it's shot on video, so don't expect a visual feast here. The same notion of displeasure with where the Doinel character was going (or not going) surfaces in a 1981 interview from Champ contre Champ. 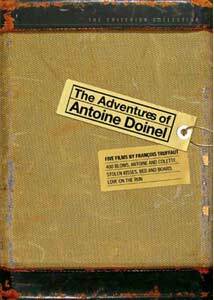 Indeed, Truffaut makes the frankly astonishing suggestion that some other filmmaker ought to take up the adventures of Antoine Doinel. The interviewers also challenge the director a bit on the evolution of his critical views as expressed in the 1950s. Finishing off the disc is a set of seven pieces of poster art from U.S. and French releases of the Doinel pictures, omitting Love at Twenty. The posters are all well-labeled and nicely reproduced. Balancing the avalanche of on-disc supplements, Antoine's souvenirs are also nestled in his suitcase—a 72-page "scrapbook" in the style of a French lesson book featuring essays, short stories, work notes and complete treatments by Truffaut, a smattering of photos and production stills, and brief essays by various writers, one for each film. In other words, it's chock full of direct and relevant information, straight from the director, with third-party opinion kept to a minimum. Hallelujah! Criterion has created a runaway success with this release. They've stuffed this valise to bulging with pertinent and informational material sure to please Doinel aficionados and inspire new fans. (Zut alors! Would a contemporary Léaud interview have broken the catches?) While there are redundancies in what is said from one supplement to the next, this is forgivable based on the age of the material—it's not as if the participants schlepped the junket for weeks repeating themselves; these have been years in the making. Pack your bags for this lifetime adventure! Truffaut's five-film sequence gets the definitive treatment from Criterion, with new, much-improved transfers, a trunkfull of truly relevant "souvenirs" and some of the most uniquely detailed packaging you'll ever find in a DVD set. Bon voyage!